This is not the place for Redskins (doesn’t that sound offensive by itself?) news, but given the circus that the ‘Skins’ (better) head coaching search has become, I thought I’d check in with some thoughts. First of all, it’s pretty obvious that Joe Gibbs isn’t around to reign in Danny Boy (Snyder) anymore. DB is dismantling Gibbs’ staff, firing both the defensive (Gregg Williams) and offensive coordinators Saturday and replacing at least one, offensive coordinator Al Saunders, with Jim Zorn. Now, how do you hire an offensive coordinator when you haven’t hired a head coach? That’s the rub. You don’t. Snyder has picked his man, and I doubt it’s Jim Fassel. Danny Boy used Fassel for cover four years ago when he hired Gibbs. I think Fassel is being used for cover again because Snyder plans to hire Giants’ defensive coordinator Steve Spagnuolo. Why else would Snyder name Greg Blache (who I knew years ago when he was a grad assistant under Ara Parseghian at Notre Dame), who has never been a coordinator unless the owner plans to name a head coach with defensive coordinator experience? 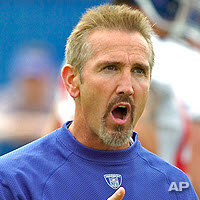 And, given that Spagnuolo is busy preparing the New York Giants for the Super Bowl Feb. 3 against the New England Patriots, the last thing he wants or needs is a public distraction. So it makes sense for Danny Boy to protect him by running cover with Fassel. Of course, as Dennis Miller likes to say, I could be wrong! By the way, if you’re not reading the Washington Post’s Jason La Canfora‘s “Redskins Insider” blog, you’re not keeping up with the news. EXERCISE: What’s the difference between this opinion piece I’ve written; George Solomon‘s lead column item, “Snyder’s Search Is Becoming More and More Baffling,” in Sunday’s Washington Post; Mike Wise‘s column, “The Coldest Shoulder,” in Sunday’s Washington Post; and Jason La Canfora‘s lead story, “Williams, Redskins Part Ways,” on the Redskins’ coaching situation in Sunday’s Post? You can make your comment below. This entry was posted on January 26, 2008 at 6:37 pm	and is filed under Uncategorized. You can follow any responses to this entry through the RSS 2.0 feed. You can leave a response, or trackback from your own site. Well first off Professor Klein, your piece is erroneous. New defensive coordinator Greg Blache has plenty of experience as a coordinator, having manned the Chicago Bears excellent for five season, from 1999 to 2003. Furthermore, I see no reason to interview Spagnulo, other than to pick his brain for next year’s games against the New York Giants. He only has one year of experience as a coordinator. Then again, this is Dan Snyder’s circus, so who knows. The most obvious difference is that the last one (La Canfora, i believe it was) is a hard news story, whereas the others are either opinion pieces or feature stories. They take different approaches to basically the same story, mixing varying amounts of opinion and fact to paint a different picture of the same story. Steve Marriucci is on the way in, you heard it here second. As ESPN first reported yesterday, both defensive coordinator Greg Blache and offensive coordinator Jim Zorn come from the Mike Holmgrem branch of the Bill Walsh coaching tree. All these hires come point to one conclucion, Marriucci. A Mariucci hire means a 4-12 season next year, no question about it. He can coach the daylights out of that team but to transition an entire offensive from a power run-sideline pass offense to a west coast with a young quarterback would be a nightmare for all Redskins fans to witness.